a) Called Surplus Shed for a small doublet 31mm fl 210mm. Really friendly over the phone and asked the right questions. b) Bid on a .965 Porro prism. 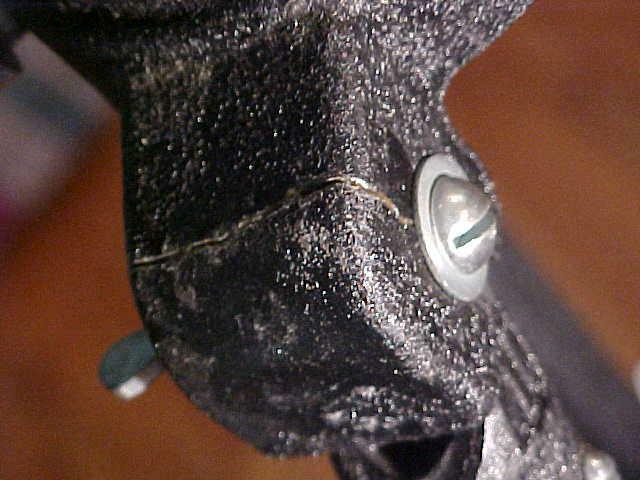 c) The break in the mount (see pic) is glued with an animal glue so I'm going to use JB Weld. d) My local Kelly Moore paint dealer is attempting to match the scope color in a metal friendly enamal so I can do some touch ups. e) Bought batteries for the night light, will post pics of test time. Some questions to the group. Black crinkle finish paint, any suggestions? The RA and Dec are a bit sticky, so I'd like to regrease. Will be taking pics along the way. I think I saw some crinkle finish paint in the local Sears Hardware store,Comes in a spray paint .They should have it in black.hope this helps. Although you could just paint the head with a semi gloss black being the texture is already there just paint over it .it will still be there. They didn't have it at my Sears Hardware so I went to NAPA Auto Parts store and they had many cans of black wrinkle enamel as well as gray. This stuff worked very well and will work if instructions are followed carefully. For instance, you really need a few liberal coats of the paint on for it to wrinkle up really good. It wrinkles very consistently if you place the painted items in the oven at 160 degrees for a half hour. I lost my bid for a .965 porro prism since I was away from my computer this weekend. C'est la vie. Does anyone one on this forum have a extra, Sears era, porro they would be willing to sell? I'll post a "wanted" in shop 'n swap in few days if it doesn't happen. I'm re-painting the tripod legs today, if it's not to breezy outside. 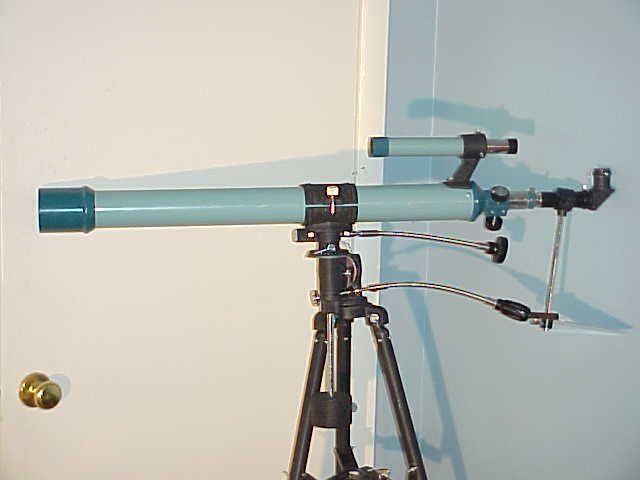 Though I'm also tempted to buy the wooden legs on Ebay for this scope. would look good on your's . I have this box containing a Sears 60mm model 6333 that is in need of a new home. I think it has a porro prism plus the wooden legs. As I recall, it is all there but there are a few dings here and there on the OTA, not pristine but quite good for a scope of this vintage.